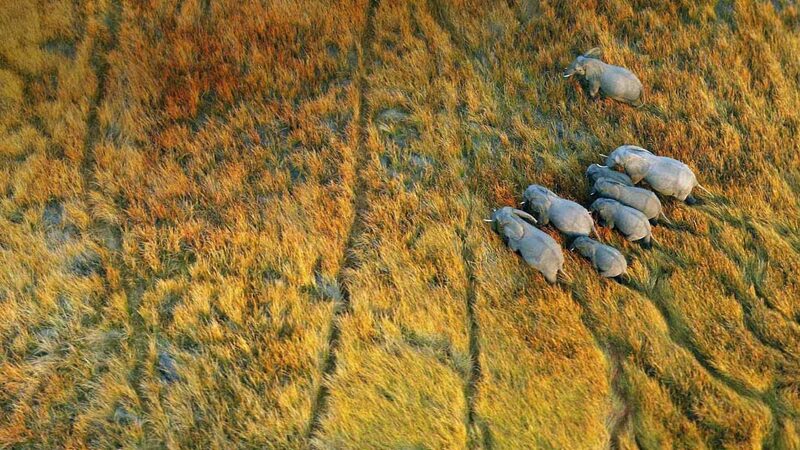 If we had to pick the most extraordinary African place of all, it might well be the Okavango Delta. The vast wetland system that covers an area of around 16,000 kilometres is home to an exceptional variety of terrestrial and water species. Botswana’s timeless wilderness is extensive and breathtakingly beautiful, and the Delta is a wildlife wonderland – from tiny, colourful frogs to strong, spectacular predators. The ‘Botswana the Great’ tour starts at the exquisite and luxurious Relais and Chateaux accredited- Zarafa Camp situated in the heart of the Delta where you will spend the first few nights. Overlooking the crystal waters of Zibadianja Lagoon, the source of the famous Savute Channel, every area of the camp has a magnificent view. The lagoon is also the water source for a tremendous population of wildlife – dry season sightings boast buffalo and elephant by the hundreds. Next, you will board a short, chartered flight to the Relais and Chateaux-accredited Duba Plains Camp in the Delta that will charm you from the get-go. Duba Plains Camp is the place that the owners and National Geographic filmmakers, conservationists and explorers, Dereck and Beverly Joubert call home. The renowned and totally brand new Relais and Chateaux accredited Duba Plains Camp sits in the heart of the Okavango Delta, the 77,000-hectare private reserve typical of the region’s unique landscape. It is a wildlife connoisseur’s getaway with literally thousands of animals in an almost endless pattern across the floodplains. Duma Tau, meaning ‘roar of the lion,’ is a ten-roomed (eight twin and two family) luxury tented camp located in the private Linyanti Wildlife Reserve that borders the western boundary of Chobe National Park. It is at this magical lodge where you will spend your next three nights. To end this incredible tour off on the highest of high notes, you will board a short, chartered flight to the charming and breathtakingly beautiful Machaba Lodge, situated in the game-rich Khwai area. The Khwai Concession is a 180 000 hectare reserve situated in the northeastern Okavango adjacent to the Moremi Game Reserve. The name Machaba is the local Setswana name for the Sycamore Fig Tree, the tree of life. Contact us now to begin planning your ultimate safari holiday. Fly from Johannesburg direct to Maun, the gateway to the Okavango Delta. Then it’s a short air charter into the Delta itself and onwards to Zarafa Camp. This is an incredible flight – you will literally fly right over the Big 5, spotting elephants from your seat. As the heat of the day dissipates and the dust of the plains settles, a beautiful peace descends on the Zibadianja Lagoon, the source of the Savute Channel. This is where famed National Geographic filmmakers Dereck and Beverly Joubert, co-founders of Great Plains Conservation, lay their weary heads many long years ago, exhausted from filming. The tranquillity they found as they slept under the tree stayed with them, and a decade and a half later, having raised enough money to begin their Great Plains journey, the magnificent ebony became the focal point of a camp whose name had a fascinating journey all of its own… Zarafa. Just four magnificent tented villas and a spectacular main area, all raised on the decking to take advantage of views over the lagoon, reflect the desire for exclusivity and privacy which inspired Zarafa’s design. Activities include Early morning and late afternoon/early evening game viewing in open 4×4 vehicles, guided walks and cruising on the Zibadianja Lagoon on “HMS Zib” when water levels permit. The camp has an open-air gym and offers in-room massages. A short-chartered flight will take you the Relais and Chateaux accredited Duba Plains Camp in the Delta. You will spend the next three nights at this exquisite lodge. This is the place that the owners, and National Geographic filmmakers, conservationists and explorers, Dereck and Beverly Joubert, chose for their home base. Great Plains Conservation is the only operator on the concession, thereby offering guests the ultimate opportunity for private wildlife sightings. Duba Plains prides itself on its extraordinary wildlife experiences and intimate up-close exposure to the best of the best wildlife, from lions and leopards to elephants and buffalo and everything in between. Duba Plains is also known for interesting Kalahari species like Aardwolf and Pangolins. Activities include early morning and late afternoon/early evening game drives in an open 4×4 vehicle and boat-based activities when water levels permit. Duba Plains Camp offers 5 bespoke tents, in addition to a separate 2 bedroom suite aptly named the Duba Plains Suite, all designed by Dereck Joubert to blend into the forest and to take advantage of the shapes and textures of the shade but also to evoke the old classic African safari style of the 1920’s. It is a wildlife connoisseur’s getaway with literally thousands of animals in an almost endless pattern across the floodplains. A short-chartered flight after breakfast will take you to the exquisite Duma Tau Camp in Chobe, where you will spend the next three nights in awe of the breathtakingly beautiful scenery around you. DumaTau, meaning ‘roar of the lion,’ is a ten-roomed (eight twin and two family) luxury tented camp located in the private Linyanti Wildlife Reserve that borders the western boundary of Chobe National Park. It is situated close to the source of the Savute Channel on Osprey Lagoon, one of the many lagoons within the Linyanti Swamp system, and between two elephant ‘corridors’ – all of which results in a plethora of wildlife on game drives along the Savute. DumaTau Camp is raised off the ground to take advantage of the fantastic river views. Each en-suite tent is spacious, spreading out under a canvas roof, with clear-storey sliding doors and windows that allow for wide-angled views of the riverfront. There is an airy, expansive dining and lounge area and a pool, all overlooking the lagoon and its denizens. DumaTau has a very light carbon footprint and runs on solar energy. After breakfast, you will embark onto the last leg of your journey by boarding a short chartered flight to the charming and stunningly beautiful Machaba Camp, where you will spend your last three nights of this incredible safari. Machaba Camp is situated in the game rich Khwai area. The Khwai Concession is a 180 000 hectare reserve situated in the northeastern Okavango adjacent to the Moremi Game Reserve. The name Machaba is the local Setswana name for the Sycamore Fig Tree, the tree of life. Machaba Camp is independently owned and run and is aimed at the affordable luxury travel markets across the world, offering great value for money and a unique classical safari experience. Machaba Camp will appeal to the novice safari guest as well as to the seasoned safari traveller. Machaba trees are renowned for their abundant fruit, which feed a vast array of animals throughout the year, including elephant, baboons, bushbuck, green pigeons and many more. The camp is built in the classic 1950’s style, with luxury safari tents, en-suite bathrooms and living areas, not forgetting the romantic outdoor showers. All the tents are situated on the ground and the pathways to the tents meander between the large riverine trees. All 10 luxury tents are situated in the beautiful riverine treeline on the Khwai River, overlooking the famous Moremi Game Reserve. From these tented verandas, one can watch the daily parade of animals coming down to drink at the river in front of camp. After a scrumptious breakfast, guests will fly back to Johannesburg via Maun from where they will fly back home after a dream safari. As with all the tours on our website, this is just an example of what you can do. All our tours are formed from scratch for each individual client, destinations and accommodation are coordinated not only to your personal tastes and requirements but also to your budget. Contact us now to begin planning your dream safari holiday.